Prime + Proper has been mentioned as one of the finest steakhouses in America. When it opens over the next several weeks, there will be many diners anxious to check out the new facility in downtown Detroit’s Capitol Park neighborhood. The street level dining room is famous for amazing appetizers and a 100 percent USDA prime beef and lamb menu, which is all dry aged in-house. There's also a second level and a cocktail bar that inflate the entire square footage to just under 11,000 square feet. With this much space comes the need for additional refrigeration, and with a downtown urban location comes numerous spatial challenges. In conjunction with the design team at Great Lake Culinary Designs, who implemented the Eco-Cool system and five compressors, Prime + Proper was able to operate three walk-in coolers, one walk-in freezer, five refrigerated cases, and 10 wine cases. The system has 100 percent redundancy and utilizes a new automatic changeover function to a back-up compressor in the event of failure. Also included is an audio/visual alarm that alerts staff in case of compressor failure, and an environmental controller with a desiccant dryer was installed on one of the coolers for humidity control of the meat aging cooler. Normally this type of refrigeration would have required 18 compressors. 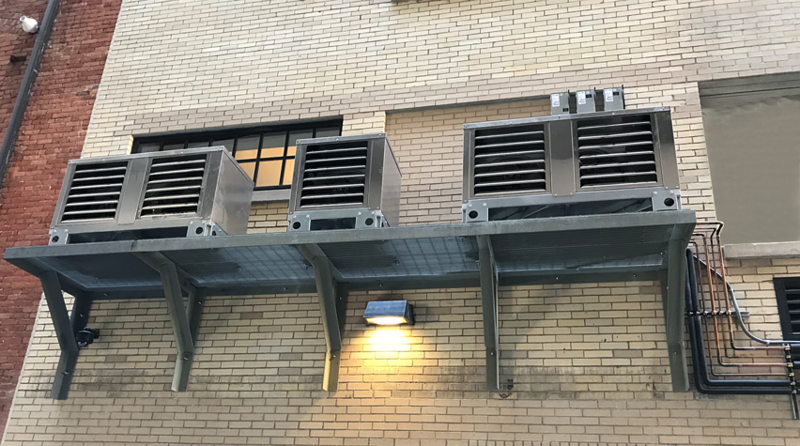 And with Eco-Cool, remote condensers are located outside the building (as pictured in the image above) with compressors located inside for a true, remote air application. Discover all the Eco-Cool details, and see the many reasons it can help your foodservice operation. Watch the award-winning Eco-Cool Cost Savings Animation.